Looking for a chance to win a rare White T-Mobile G2x model? 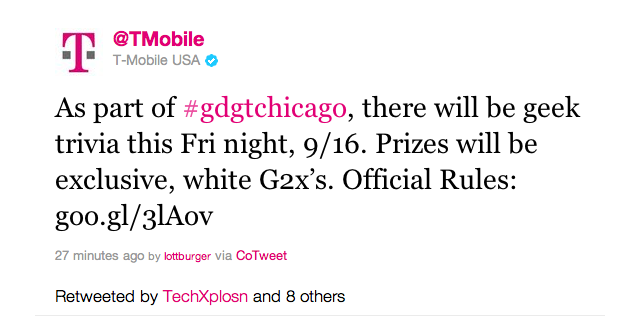 Well tomorrow night is your chance as T-Mobile is hosting another trivia night via Twitter as part of the #gdgtChicago event being held tomorrow evening. This isn’t the first time we’ve seen T-Mobile host trivia contests providing winners with a chance to win fun prizes so if you’re around tomorrow evening keep an eye on Twitter for your chance to win! There are three white G2x’s on the block so check out all the rules and regs below. ELIGIBILITY: The Ultimate Entertainment Experience G2x Sweepstakes (the “Promotion”) is being held in Chicago, Illinois; and online via T-Mobile’s Twitter account (http://twitter.com/tmobile) and is open to legal residents of the 50 United States and the District of Columbia, 18 years and older. Void where prohibited. Employees of T-Mobile USA, Inc. (“Sponsor”) and their respective parents, affiliates and subsidiaries, anyone professionally associated with their advertising and promotion agencies, and their immediate family (spouse, parent, child, sibling and their respective spouses, regardless of where they reside) and household members of each, whether or not related, are not eligible to enter or win. Promotion is subject to all applicable federal, state and local laws and regulations. T-Mobile USA Twitter (online), http://twitter.com/tmobile (“Twitter”). Commences at 7:00:01 PM local time on 9/16/11 and ends at 11:00:00 PM local time on 9/16/11 at Chicago and Twitter Promotion Locations. Chicago: During the Promotion Period, visit the T-Mobile booth located at the Chicago Promotion Location and follow the directions provided to complete and submit a survey card and an official entry form, which includes providing your name, email address and Twitter handle, while supplies last. All entry forms must be submitted in an entry box provided at the Promotion Locations during the Promotion Period to be eligible. Limit one (1) entry per person, per email address, per Twitter handle. Entries received from any person, email address, or Twitter handle after the first entry received from that person, email address or Twitter handle will be void. Entries generated by mechanical means and entries by any means which subvert the entry process are void. All entries become the property of Sponsor and will not be acknowledged or returned. Twitter: During the Promotion Period, send a tweet/message to the T-Mobile Twitter account (@TMobile) using the event hashtag “#gdgtchicago”. All entries must be submitted via Twitter during the Promotion Period to be eligible. There is no limit to the number of online entries that can be submitted. Entries generated by mechanical means and entries by any means which subvert the entry process are void. All entries become the property of Sponsor and will not be acknowledged or returned. RANDOM DRAWING AND WINNER NOTIFICATION: Potential Grand Prize winners will be selected in random drawings at or about 11:05 PM local time on 9/16/11 at the Chicago Promotion Location, and at or about 11:05 PM local time on 9/16/11 for the online Twitter location, from among all eligible entries received at each respective Promotion Location. The potential Grand Prize winners at each Promotion Location do not need to be present to win and will be notified via Twitter handle and may be required to execute and return an affidavit of eligibility, a liability release, and, where lawful, a publicity release. Failure to complete such documents, the inability of Sponsor to contact the potential Grand Prize winner within a reasonable time period, or failure to comply with these Official Rules may result in forfeiture of prize and, at Sponsor’s sole discretion, the selection of an alternate winner. The Grand Prize will ship within four (4) to six (6) weeks of the end of the Promotion Period. If prize or prize notification is returned as non-deliverable, Sponsor is unable to contact a potential Grand Prize winner within a reasonable time period or potential Grand Prize winner is not in compliance with these Official Rules, prize will be forfeited and Sponsor will have no further obligation to such winner. Odds of winning a prize depend on the total number of eligible entries received during the Promotion Period. If any winner is at least 18 but still considered a minor in his/her jurisdiction of residence, Sponsor reserves the right to award the prize in the name of his/her parent or legal guardian who will be responsible for fulfilling all requirements imposed on winners set forth herein. PRIZES: Two (2) Grand Prizes for Chicago Promotion Location: Each winner at the Chicago Promotion Location will receive one (1) T-Mobile® G2x™ with Google™ smartphone (service not included). Approximate Retail Value (“ARV”): $449.99. Three (3) Grand Prizes for Twitter Promotion: Each winner at the Twitter promotion location will receive one (1) T-Mobile® G2x™ with Google™ (service not included) Approximate Retail Value (“ARV”): $449.99. Total ARV: $2,249.95. Prizes are awarded “as is” with no warranty or guarantee, either express or implied by Sponsor. Winners are responsible for all federal, state and local taxes and all other costs and expenses associated with prize acceptance and use not specified herein as being awarded, including any wireless service plan for the T-Mobile® G2x™ with Google™. No transfer, substitution or cash equivalent of prizes is permitted by winners. Sponsor reserves the right, at its sole discretion, to substitute a prize (or portion thereof) with one of comparable or greater value. All prize details are at Sponsor’s discretion. Limit one (1) prize per person for the entire Promotion Period. General Conditions: Released Parties (as defined below) are not responsible for lost, late, incomplete, inaccurate, stolen, misdirected, undelivered, or delayed entries, or for lost or stolen entry boxes; or for malfunctions, failures or difficulties, or other errors or difficulties of any kind whether human, mechanical, typographical, or otherwise relating to or in connection with the Promotion, including, without limitation, errors or difficulties which may occur in connection with the administration of the Promotion, the processing of entries, the announcement of the prizes or in any Promotion-related materials. Released Parties are also not responsible for any incorrect or inaccurate information, whether caused by tampering, hacking, or by any equipment or programming associated with or utilized in the Promotion. Persons who tamper with or abuse any aspect of the Promotion or who are in violation of these Official Rules, as solely determined by Sponsor, will be disqualified and all associated entries will be void. Should any portion of the Promotion be, in Sponsor’s sole opinion, compromised by non-authorized human intervention or other causes which, in the sole opinion of the Sponsor, corrupt or impair the administration, security, fairness or proper play of the Promotion, or submission of entries, Sponsor reserves the right at its sole discretion to suspend, modify or terminate the Promotion (or portion thereof) and, if terminated, at its discretion, select the potential winners from all eligible, non-suspect entries received for the drawing prior to such action. Entrants, by participating, agree that Sponsor, and its parent, affiliates, subsidiaries, prize suppliers, and advertising and promotion agencies and all of their respective officers, directors, employees, representatives and agents (collectively, “Released Parties”) will have no liability whatsoever for, and shall be held harmless by entrants against, any liability, for any injuries, losses or damages of any kind, including death, to persons, or property resulting in whole or in part, directly or indirectly, from acceptance, possession, misuse or use of a prize or participation in this Promotion. Each winner, by acceptance of a prize, except where legally prohibited, grants permission for Sponsor and its designees to use his/her name, address (city and state), photograph, voice and/or other likeness for advertising, trade and promotional purposes without further compensation, in all media now known or hereafter discovered, worldwide in perpetuity, without notice or review or approval. CAUTION: ANY ATTEMPT BY ANY PARTICIPANT TO DELIBERATELY DAMAGE OR UNDERMINE THE LEGITIMATE OPERATION OF THE PROMOTION IS A VIOLATION OF CRIMINAL AND CIVIL LAWS. SHOULD SUCH AN ATTEMPT BE MADE, SPONSOR RESERVES THE RIGHT TO SEEK REMEDIES AND DAMAGES FROM ANY SUCH ENTRANT(S) TO THE FULLEST EXTENT PERMITTED BY LAW. WINNERS’ LIST: For the names of the winners (available after 9/30/2011), send an email to: Christopher.Elliott20 (at) t-mobile.com. Requests must be received by 10/30/2011. SPONSOR: T-Mobile USA, Inc., 12920 SE 38th Street, Bellevue, WA 98006. This almost made me interested until I heard it was for the G2X, having had one since they came out and all the problems I have had with mine, I can only hope those who actually win one of these “exclusive” white ones don’t have the issue the regular ones have been prone to. Retention gave me a free (NEW) G2x with Gingerbread. Works great since I got it nearly 2 months ago. Sent me the unlock code too. But when its free, it doesn’t matter if it has problems. Nothing paid…..nothing lost. that’s how I feel. I would rather have a root canal done then win a Free G2X, because at least i’ll get the Nitrous oxide and have a good laugh (fun times). You will pay in anguish and frustration. You will loose valuable time and any faith you may have had in LG. wait…they don’t just give it to you for signing up? look at this user made windows mango commercial! A rare G2X? One that works? A G2x, free? Let the flaming begin. LOL. Just checked,gadget Chicago is free. White G2x sure. Maybe Carly will be there..prolly not. AT$T will be there too. If ya bend over they’ll give ya something.